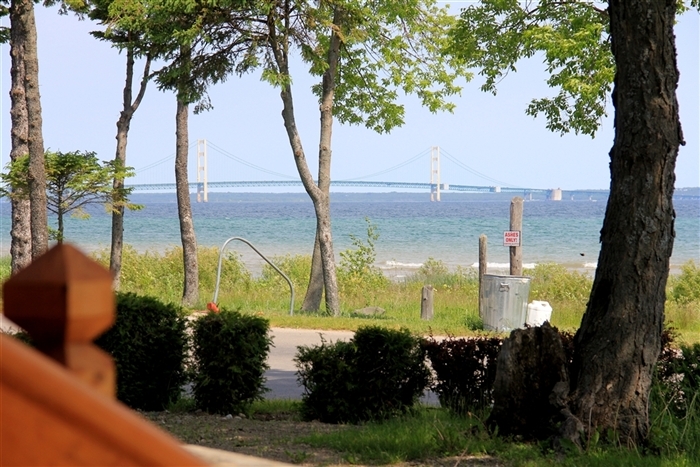 Mackinaw Mill Creek is a very large, well run campground. The property is huge, about 200 acres. We had a lakeside site that was simply spectacular! This is the third time we have camped here and it won’t be our last. Check-in is fast and the employees were always friendly. They have some very large RV sites (40′ x 60′), a very nicely stocked camp store and a great arcade for the kids. The campground also has miles of very scenic trails and roads inside the property. Check out the Mackinaw Bridge at sunset… it’s absolutely beautiful. The campground has a restored 1940s era fire truck. Most evenings, they give rides to campers through the park. Amenities also include a heated pool, wi-fi, vollyball, three playgrounds, carriage bike rentals, sandy beaches, and lots of places to explore! Don’t forget to bring your bike… this is a big campground and it will come in handy. We love it here and plan on making this a regular stop every summer!